I’m thrilled to be able to welcome our newest TBYL Reviewer to the team – the amazing Carolyn Jones! Welcome Carolyn, I can’t wait to share your wonderful reviews! The Storyteller’s Daughter is a tale of a young and intelligent woman who suddenly leaves her ordered life and promising career as a geneticist to look after her sick Mother. Meg May believes her mother to be crazy, largely due to that fact that she has always avoided answering direct questions, rather replacing factual answers with a wonderful, imaginative concoction of make-believe centred around food; Val’s favourite thing in the world. As a result, all that Meg remembers from her early childhood is a mixture of stories created by Val. I found it hard, in the beginning, to warm to Meg while she distanced herself from her mother’s creativity and focussed on the factual. However, Maria Goodin develops this character gently so that I was able to find a place in my heart for her. If you want to make the perfect sponge cake you need to prepare the batter carefully for it rise. Meg’s memory is peppered with holes and she wants more than anything to fill those gaps. So much so that she feels she has to grow up well before her time and to become the parent to her fantastical and eccentric mother. Throughout the novel Meg takes a journey of discovery, learning about her past and interestingly, surrounding herself with others who prefer make-believe over concrete and scientific evidence. The other characters this novel serves up all have a tale to tell, some factual and others mythological, but all delightful for the reader to immerse themselves in. 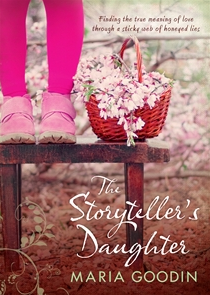 Upon starting The Storyteller’s Daughter, I must admit, I thought I knew where the narrative was going, following a recipe of a strained mother-daughter relationship. How wrong could I be?! Even though Val makes up stories to hide behind her own past, the reader can’t help but be intrigued by her colourful accounts. The stories are delicious and I could imagine how cosy it would be to sit by the Aga in Val’s kitchen, with the aromas of baking buttery pastries, sipping on a cup of tea and tasting her famous raspberry tartlets all the while savouring exotic tales of a beautiful time and relationship between mother and daughter. I really enjoyed this book, it allows the reader to conjure up images of delectable treats, baked goods, abundant vegetable gardens, orchards and a delightful English cottage, all in order to tell a story of two people facing their past and present. I was moved to the point of tears at times as Val and Meg learn what it means to truly love someone. Some elements of the story made me laugh but it was the unexpected outcomes that made more of an impact. The Storyteller’s Daughter was a great holiday read and it left me feeling satisfied, just like one does after an afternoon of eating (including dessert).